Link to the auction if you don't wish to read the ramblings! 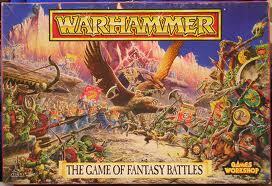 This is the oldest army in my collection, started twenty years ago when I first discovered Warhammer Fantasy Battle. 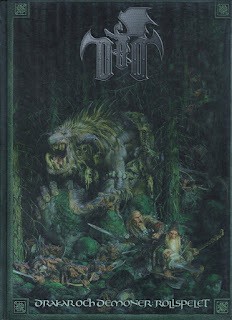 My first purchase was the starter set containing single pose plastic elves and goblins, some of which eventually got painted as part of my High Elf army. Not that I jumped in straight away and painted to this level! I had painted up some undead and various other figures before attempting the elves as they seemed particularly challenging. 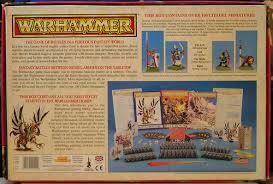 The plastic spearmen and archers were probably about five years into my Warhammer love affair. I have enjoyed many a game with this force. My earliest gaming was just me and my brothers with the boxset contents, plastic grey single pose figures with cardboard cutouts for monsters, artillery and characters. How we complained about snipping all the bits from the sprue, we couldn't even comprehend painting them. Prior to this we had played boardgames like Talisman, Cosmic Encounter and Heroquest, so this was a whole new world for us. Slowly my collection expanded, often at Games Workshop store opening events. At this time (mid to late 1990's) they would offer 3 blisters for the price of 2, discount vouchers and sale bins to entice the crowds. I can remember buying blisters of the old dwarf metals at £1 each, so 25p per figure. Given that armies at that time contained regiments of 10 to 15 troops, it was easy to pick up a regiment for £5, an army for about £50. Those were the days! Of course most of the time it was a case of saving up money to buy metal regiments at full price, back then 3 figures for £5 was at the high end of the hobby. The army built up slowly over time and I used it in many a game, by this time I had joined a gaming club and even attended tournaments. In fact, my one and only painting award was won by this army at a tournament in Sheffield. My other claim to fame is that it was "spotted" and photographed by the GW bods, though sadly never published. Eventually I played less and less with the army. I think it was the introduction of Intrigue at Court that killed my enthusiasm for the pointy-eared ones. Elf infantry has always been a fragile proposition (less so in the modern game), partly offset by good leadership, so randomising the general really hurt my game. 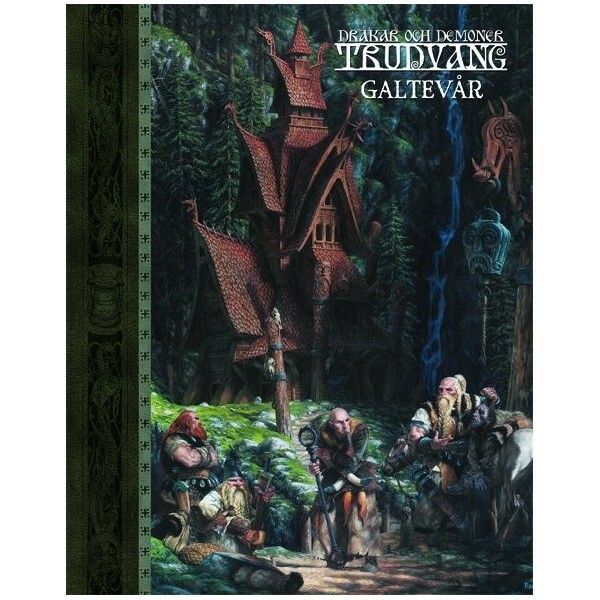 The elves were usurped by Chaos, then Dwarfs and Undead, as my main army. And so they have sat in my glass cabinet for the past decade, relic of a bygone age. I have said many a time that I will get back to them, but that's unlikely now that the game has gone the way it has, so for me it's time to potentially say goodbye. They are listed on ebay, with a fairly high starting price. If they sell at this price, I will have enough hobby funds to keep me entertained for a couple of years at least. If they don't sell, I will probably rebase them at some point and maybe use them in other rulesets. Element based games like Hail Caesar or Impetus are on my to do list, maybe they will resurface as my first army in those systems at some stage. In the meantime, writing this post has gotten me quite nostalgic. 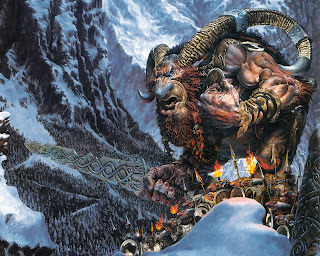 Here's the picture that grabbed my attention all those years ago, I bought my first White Dwarf on the strength of this image on the cover, the rest (as they say) is history. Another game of LOTR strategy battle game was fought down in the dungeon on Friday night, but this time Matt remembered to take some photos on his ipad. Lighting is not ideal for photography, there are a number of spotlights, hence the floodlit appearance on the pictures, but they give a reasonable flavour of the game. The troll and the majority of the orcs headed for the bridge, guarded by a dozen or so men of Gondor and a couple of heroes. 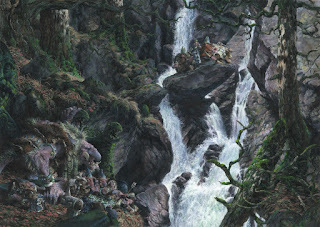 Legolas took up position on a small hill and picked off a few orcs on the bridge. Aragorn took the more direct approach, charging straight at the troll. After a worrying start, he soon had the measure of the beast. With a mighty blow (a double 6 to wound!) he toppled the behemoth and scattered a few orcs into the river for good measure. But still the orcs came on. Thinking that I might gain an advantage by spreading my forces, some of the orcs chose to wade across the river, lead by Gothmog, with the weakling Elven prince in their sights. Further downstream, a small band of warg riders attempted to outflank the forces of good. They successfully negotiated the shallow crossing without mishap and raced up on to a small rise. 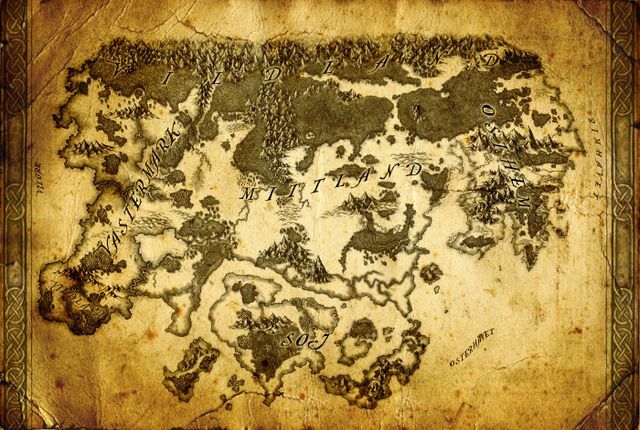 Gathering together for a concentrated charge, they hesitated a little too long, for suddenly they were assailed by Gimli and his band of Gondor men. 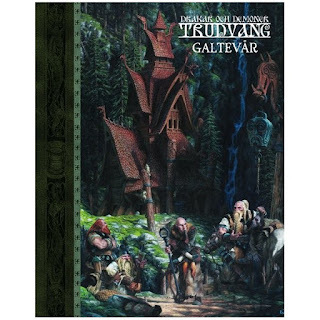 The dwarven axe felled many, the rest dispatched by spear and sword. 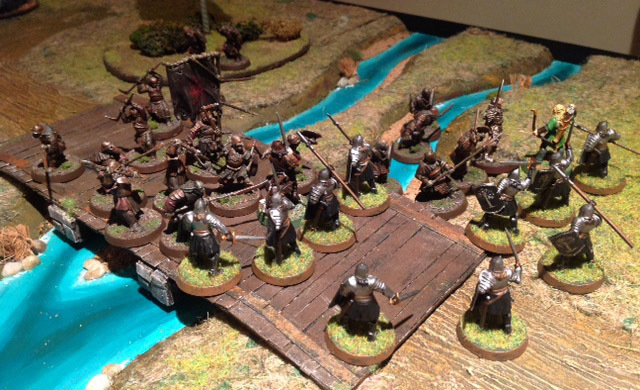 Not wanting to be bested by a pointy-eared elf, the doughty dwarf sprinted upstream to the bridge, keen to fell more of the orc scum. Here the fighting was most fierce. Aragorn swept many orcs aside before hacking the orc captain in two. 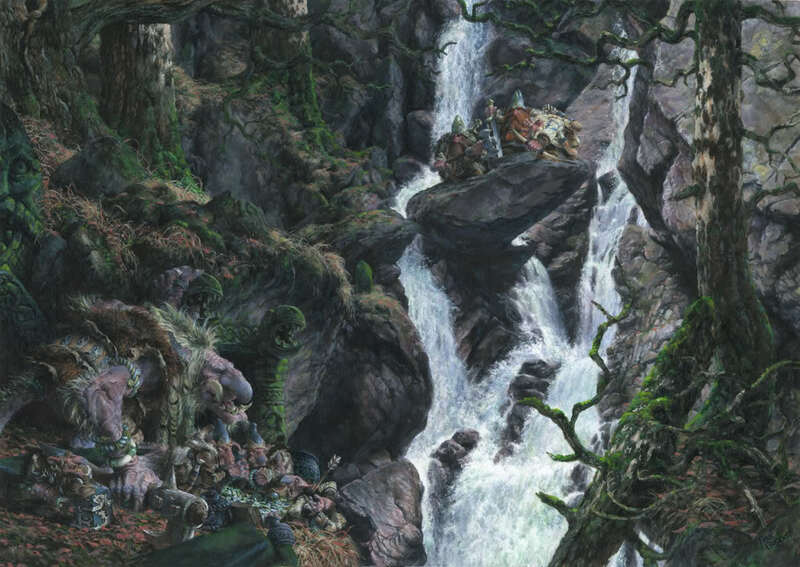 Gothmog and his followers struggled to cross the river, but finally managed to scramble up the bank. 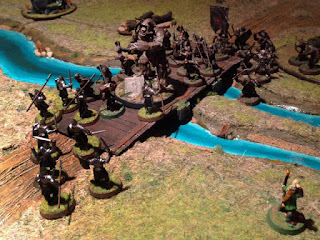 After a brief tussle, the orcs were defeated and pushed back into the swirling waters, their blood and filth staining the banks. The three heroes had proven more than a match for the Mordor scum! As Gimli finally clattered up the bridge, the few remaining orcs were legging it back to the tower. Cheers from the men of Gondor, who suffered just a couple of casualties on the bridge. 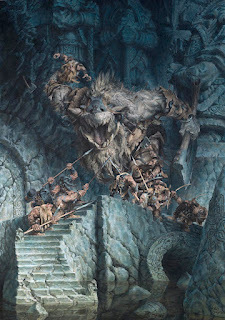 Gothmog slunk away, fearfully wounded, fearing the punishment he would receive at his master's command. 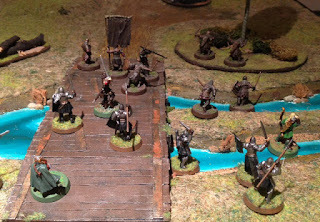 Another fine game of LOTR SBG, which turned out to be far easier than we had expected for the heroes, partly aided by Matt's uncanny ability to roll sixes and my pathetic rolling of 1s and 2s. The Mordor orcs are pretty poor troops it has to be said, I hope Gothmog can convince the overseers that stronger, better armoured orcs are needed to crush the enemies of the Eye. 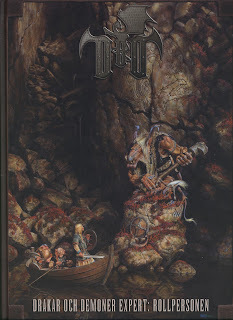 Can I hear the Black Gate slowly creaking open? 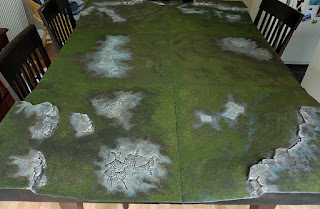 One finely painted and flocked Realm of Battle gameboard for sale! I have decided to downsize my gaming gear. This board is a nice bit of kit, some lovely details, but I just never use it. When I bought it I expected to get a few games with it, but these days I just go round to a friend's house for all my gaming, so it's just taking up room in the house. I painted it with a variety of acrylic paints, then added various flocks, hoping to get a realistic finish. The flock has been sealed with a layer of dilute PVA glue, there's no mess involved with setting up and playing, no showers of green snow to annoy the wife/girlfriend/cleaning staff. All the rock areas are well distinguished from the flat areas, I wanted to ensure there were no disputes over what constitutes high and low ground. Similarly, the terrain features such as the pits of skulls and other paving areas are very well defined, so they can be nominated as difficult ground if required, but mostly because they look nice. Hopefully, a UK gamer is on the lookout for a fully prepared gaming board. If you are interested, here is the link on ebay. EDIT The board is still up for sale, at a reduced price. It's now costs less than the RRP, is painted and sealed, saving you lots of time and materials! The daemon prince of Slaanesh is almost finished. I am pretty happy with the palette, though black horns on the head may well have been a better choice, something I might change when I come to finish it off. 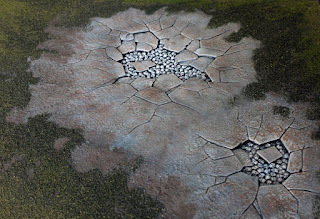 I am wondering what to do with the base, the current brown sandy effect was just a stop gap so I could appraise the model on a neutral backdrop. The fallen elven ruin was my first idea, with lush grass and white and lilac flowers. 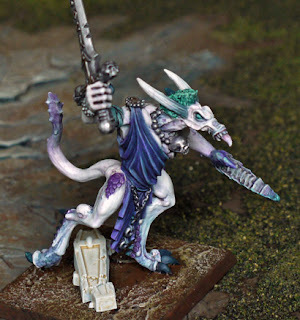 I thought this would make a change from the usual lava/brimstone most seem to go for, plus there is a little fluff about Slaanesh daemons being particularly fond of elven souls. 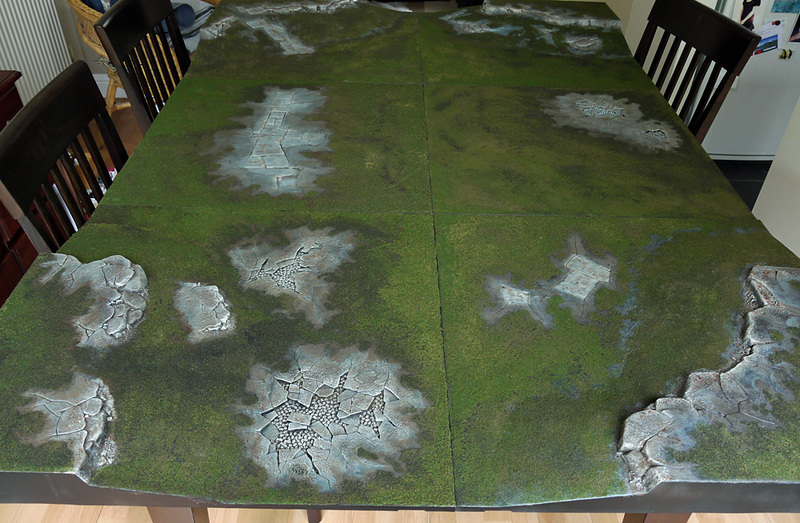 However, I am thinking of making changes to my gaming surface, so will probably test out my ideas on the daemon bases. I need to research my options a little before taking the plunge. 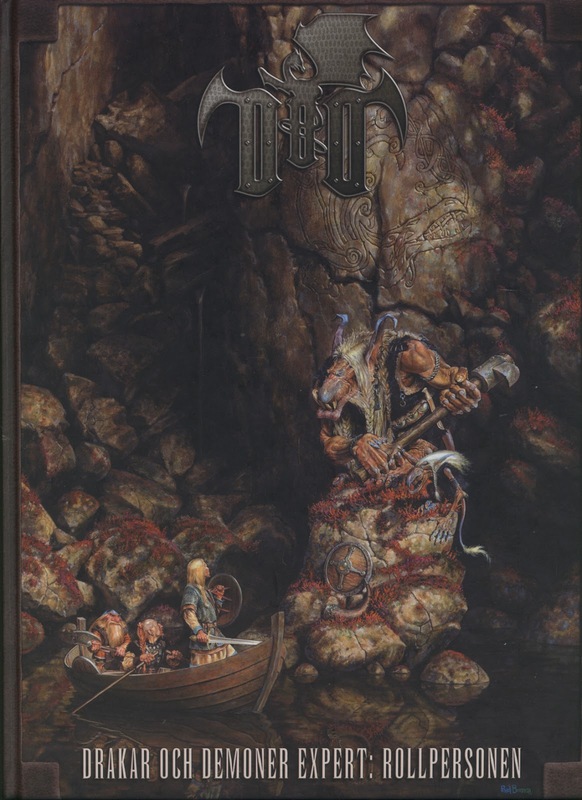 While searching for images of orcs recently, I stumbled across these wonderful pictures for a Swedish game called Drakar och Demoner. I don't usually like whimsical imagery, but these are just superb. 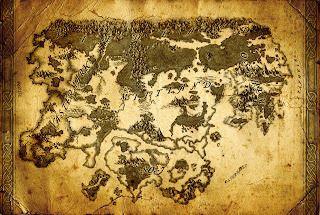 And finally, a lovely map of the world. Lucky Swedes, that's all I can say! Step 1: Prime white, I use Halfords white acrylic primer, it coats well and drys matte in a short time. When it's dry, liberally wash all over with a dark colour, I have used various browns, grey and black, mixed together. Not much of this colour will be visible at the end, this stage is purely to remove the white of the primer. Why not prime brown or grey then? I find the dark wash over the light primer shows all the detail of the figure, a bit like instant blacklining. Step 2: Most of the base colours are applied in this step. 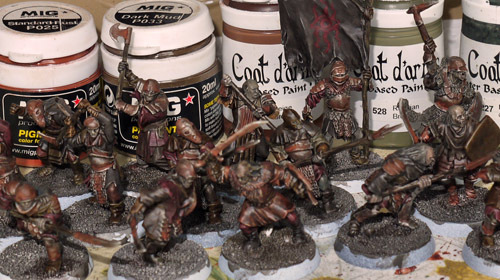 I have chosen a feature colour of P3 Sanguine Base, this is applied to the cloth garments of most of the orcs, though not all as these are not uniformed troops. The rest of the cloth areas are various browns and greys. Leathers are a lighter brown, I tend to mix these up on my palette as I go along. After about an hour or so, this got tedious, so I applied all the metal areas and stopped for the day. 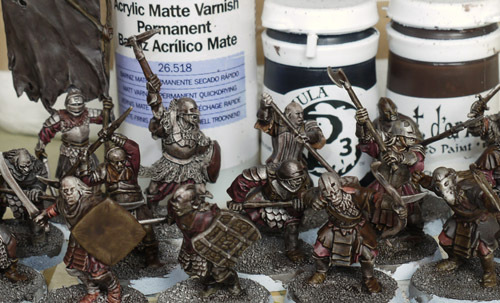 The overnight break is always a good idea when metal paints are concerned, the later stage of washing would be disastrous if the metals were not fully dried. Step 3: Any remaining cloth or leather areas are quickly blocked in before the washes. 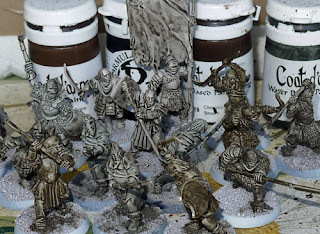 Incidentally, I am using a nice big number 5 brush to apply all these base coats, it holds a good deal of paint and is fine enough even for these size figures, as long as the point is in good condition. I am also applying these base coats slightly watered down, to give a slightly transparent coat. This allows the under colours to show through a little. In this case, the under colours are basically black and white, so the combined effect is to add a colour that has some shading, rather than a flat colour. 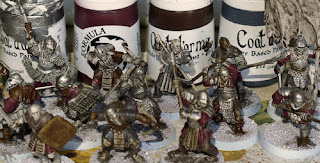 Step 4: I mixed up a wash consisting of black paint and Coat d'arms chestnut wash, roughly equal amounts, to which I added a few drops of matte varnish and matte medium. 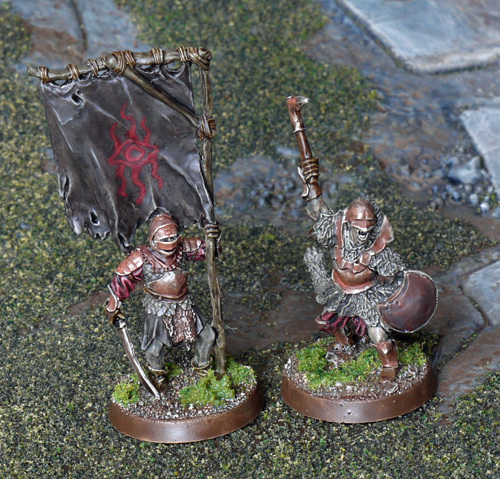 Then I painted this all over the figures with a rough old brush. When I had completed all fifteen, I went back and quickly redistributed any pooling with a small damp brush, putting into areas that need more shade, or just on to the base sand. Step 5: The skin is painted with thinned pale green, brown or grey. As with many of my colours I put a little of each on the palette and then randomly mix together for some nice pastel colours. A thin coat over the "undercolour" gives a reasonable effect. Any remaining areas not yet painted are picked out - hair/fur is grey, pelts are brown, etc. Then a final wash of brown plus black over these last areas if they need it. The last thing to do is add some rust, for this MIG pigments are a good short cut. I use dark mud then standard rust. Each of these is mixed in with a puddle of paint left on my palette and thinned with some matte varnish, then just dabbed on to the metal areas. The Mordor army is starting to shape up nicely. I have added another 15 "speed painted" orcs, making 27 in total. 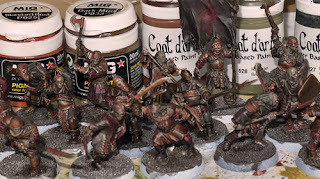 These orcs I painted over several sessions rather than all in one day like the first batch, but still they were reasonably quick to do. So now I have a decent sized mob of orc rabble, ready for gaming. 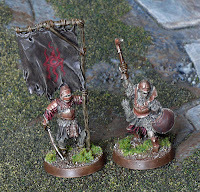 The captain and standard bearer are metal figures that I had in my lead mountain, I can't even remember why I bought them, they may have been a present for some long forgotten birthday. I have often thought that I should throw them up on ebay, but I am glad to have kept hold of them now. They add a little variety to the plastic masses. Speaking of which, I managed to pick up the plastics on ebay and the Warhammer forum at a very tasty price. 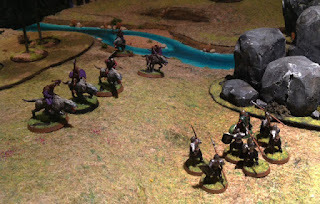 I got 60 orcs and 24 haradrim for the paltry figure of £15. 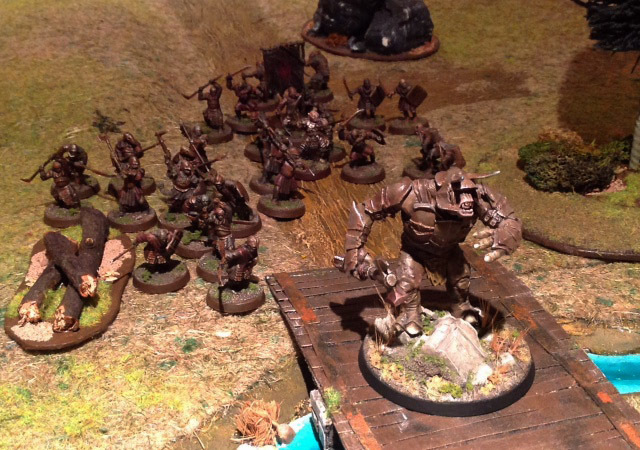 When I add in my previously painted figures of a troll and Gothmog, it seems like a very cheap and quick-to-get-on-the-battlefield army. The next step is to get this lot totalled up and then work out what I need to add to bring it up to 500 points, this being a nice size to play on a 4x4 board in a relaxed two hour session. I could add more orcs of course, but I would like to give myself a little variety with some wargs or maybe allies of some kind. Whatever I can find at a bargain price will do.